In 1417, delegates at the Council of Constance (1414-18) elected Martin V as Pope, effectively ending the Great Schism (1378-1417). This unification not only re-confirmed Rome (and the Vatican) as the Papal centre, but it prompted a revitalisation: Nicholas V (1447-55), the first Renaissance pope, planned a new basilica and palace; Sixtus IV (1471-84) and Alexander VI (1492-1503) contributed to the rebuild and revival of Rome. After election, each new pope would go to St Peter’s for crowning; the Basilica was traditionally the burial site of Peter, the first Pope. 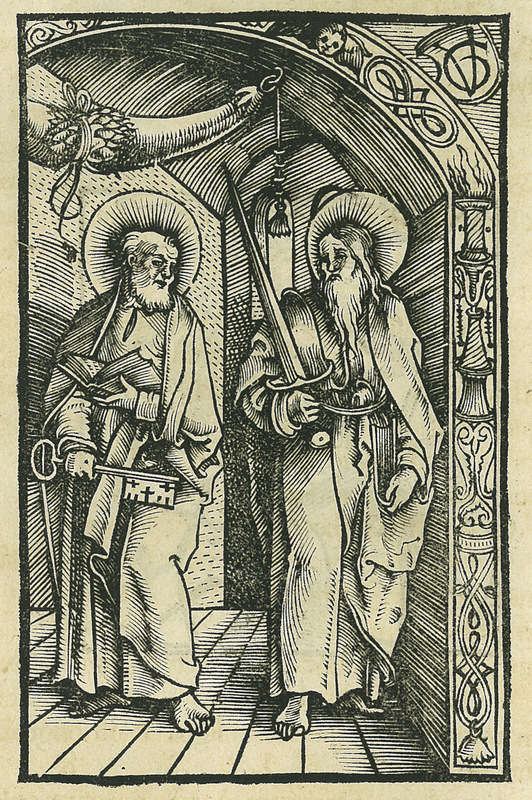 This woodcut by painter and printmaker Urs Graf (c. 1494- 1528), cut in 1512, depicts Apostles Peter and Paul: St Peter carries the keys of the kingdom of heaven (as noted in Matthew 16:18); St Paul a long sword. Francesco Albertini, “Opusculum de Mirabilibus Novae et Veteris Urbis Romae,” ourheritage.ac.nz | OUR Heritage, accessed April 26, 2019, http://ourheritage.ac.nz/items/show/10327.